BRIDGEVIEW, Ill. -- Chicago Fire technical director and now interim head coach Frank Klopas wears his Fire passion at the highest level. Klopas' soccer roots are embedded within the Fire organization and the city of Chicago, and he wants to see this club return to its glory years that he experienced as a player. But Klopas also is responsible for assembling the bulk of this year's Fire squad, which has posted a 1-4-6 record this season under recently fired head coach Carlos de los Cobos. Klopas did not want to take the coaching reigns, but this assignment is personal. "I'm going to do everything possible to make sure that when I was technical director to do the work to bring the right players here, and now as a coach, to make sure that myself and the staff do everything humanly possible to prepare the guys and give them every opportunity to be successful," Klopas said. "Then I can walk away with my head high and say I've done everything possible that I could. Then I will feel good about it." MISL Communications: Chicago Riot goalkeeper Ante Cop's game-winning strike against the Baltimore Blast ranked third among the 2010-2011 Major Indoor Soccer League Goals of the Year. BRIDGEVIEW, Ill. -- With the Chicago Fire off to their worst start in franchise history, the team fired head coach Carlos de los Cobos on Monday. De los Cobos' squad has posted a 1-4-6 record this year and is in the midst of a nine-game stretch without a victory, tying for the longest winless streak in team history. Fire technical director Frank Klopas takes over as interim head coach. 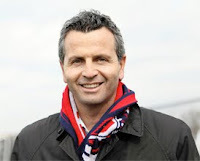 Klopas was a coaching possibility following the 2009 season, but the squad eventually decided on de los Cobos as its next head coach heading into the 2010 campaign to replace Denis Hamlett. The Fire posted a 10-16-15 record during de los Cobos' tenure, and Chicago missed the playoffs for only the second time in franchise history in 2010. Chicago is second-to-last in the Eastern Conference through a third of the 2011 season, and the team's postseason hopes already are fading as the Fire nurse a double-digit points deficit behind the East-leading Philadelphia Union. Tribune reporter Jeff Vorva chatted with several other players during the Chicago Red Stars' recent media day. The Red Stars' Women's Premier Soccer League season kicks off at 6 p.m. Wednesday, June 1 at Minnesota Kings FC. BRIDGEVIEW, Ill. -- The Chicago Fire's seemingly endless winless streak continued to press on, but things could have been much worse. Fire defender Cory Gibbs' 80th-minute header salvaged a 2-2 draw against the San Jose Earthquakes on Saturday in front of 11,926 at Toyota Park. But Chicago's winless streak reached nine games, posting a 0-4-5 record during that stretch, while posting a 1-4-6 record overall. "Right now we're not getting results," Fire captain Logan Pause said. "Listen, let's behonest, one win out of 11 is not good enough, and we know that." Gibbs' diving header struck just inside the near right post to equalize the match. Baggio Husidic sent the ball in from the right side, and Gibbs dove straight forward. Former Fire and current Quakes goalkeeper Jon Busch was trying to cover the near right post, but he could not get there in time. Gibbs ripped off his shirt in celebration, taking a yellow card in the process. Dominic Oduro also scored for the Fire, posting the 100th regular-season goal in team history. Both Fire goals came after Chicago fell behind on two different occasions in the second half. Ramiro Corrales and Chris Wondolowski netted goals to garner 1-0 and 2-1 leads, respectively, for the Quakes. The Chicago Fire, fresh off of a victory to clinch a 14th straight appearance in the Lamar Hunt U.S. Open Cup, are hoping they achieved some bit of momentum. Chicago edged the San Jose Earthquakes, 5-4, in a shootout on Tuesday during an Open Cup play-in match. Now both sides return to MLS play this Saturday as the Fire host the Quakes at Toyota Park. "I'm very pleased because the team is doing well again," Fire midfielder Marco Pappa said after the play-in victory. "The players are happy because we won, and we hope to beat them again at home." The 2011 Red Stars huddle up Wednesday. CHICAGO (May 27, 2011) -- The Chicago Red Stars of the Women's Premier Soccer League announce the additions of goalkeeper Jamie Forbes (St. Charles, Ill.) and defenders Shannon McDonnell (Orland Park, Ill.), Kecia Morway (Lake Villa, Ill.) and Sammy Scofield (Geneva, Ill.) to the team's roster for the 2011 season. A few final roster additions are forthcoming. The team also announced its finalized 10-game schedule. Chicago's first WPSL match kicks off at 6 p.m. this Wednesday, June 1, at Minnesota Kings FC in St. Michael, Minn. The Red Stars host two matches open to the public on July 2 and 10 at the Village of Lisle-Benedictine University Sports Complex, 5700 College Road, in west suburban Lisle, Ill. Chicago hosts the Iowa Rush at 5:15 p.m. Saturday, July 2, and the Red Stars host Minnesota Kings FC at 6 p.m. Sunday, July 10. All game action will be tweeted live at www.twitter.com/chicagoredstars. For more about the Red Stars, CLICK HERE for the team's WPSL page. The Chicago Red Stars refuse to fade away. Left for dead over the winter when they couldn’t find enough investors to remain in Women’s Professional Soccer for the upcoming season, the Red Stars revived to join the semipro Women’s Premier Soccer League. They will play their home games at Benedictine University in Lisle instead of Toyota Park in Bridgeview. It wasn’t always easy for friends and family to come watch Naperville’s Michele Weissenhofer play soccer during her last stint. The Neuqua Valley High School and Notre Dame University graduate played in Germany from last June through March. She said her older sister, Kristen, and a friend from Notre Dame, basketball player Melissa Lechlitner, were the only two people she knew who came to watch her play. Lechnitner happened to be playing basketball nearby. But that’s about to change. The 23-year-old hooked up with the Chicago Red Stars and will not only see some friends and family in the stands but will have some friends on the field as well. The Chicago Fire edged the San Jose Earthquakes, 5-4, in a shootout on Tuesday at Buck Shaw Stadium in Santa Clara, Calif., to advance to the Lamar Hunt U.S. Open Cup. Chicago overcame a 2-0 deficit, needed 120 minutes and then penalty kicks during its play-in match to assure itself a spot in the Open Cup for a 14th straight season. Daniel Paladini's strike proved to be the shootout winner for the four-time Open Cup champion Fire. Following Paladini, the Quakes' Scott Sealy hit the frame to close out the match. "I didn't think about it," Paladini said of his winning strike. "In a sudden death moment like that, you just have to put it in the back of the net. It was definitely exciting, and when the opposing team misses the last shot, he made himself big out there and hit the post." From 1979-84, Angelo DiBernardo played professional soccer with the New York Cosmos. He had a chance to rub elbows and practice with retired legend Pele and live the celebrity life for a while. “We were on top of the world,” DiBernardo said. The Naperville resident’s daughter, Vanessa, is not quite on top of the soccer world yet. But she could be on her way. Vanessa closed out a successful first soccer season at the University of Illinois in the fall and was named Big Ten Conference Freshman of the Year. She will spend most of her summer back in the area as she signed to play with the Chicago Red Stars, a former professional franchise that will play the 2011 campaign in the high-powered amateur division of the Women’s Premier Soccer League and will play home games at Benedictine in Lisle. The 19-year-old will be one of the younger players in the league but she doesn’t mind. The Chicago Fire and San Jose Earthquakes take a break from league play on Tuesday, but they have a lot to play for as they square off in a Lamar Hunt U.S. Open Cup play-in match at Buck Shaw Stadium. 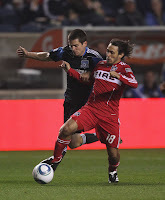 The Fire have always been a part of the Open Cup, winning four times from 1998 to 2006. 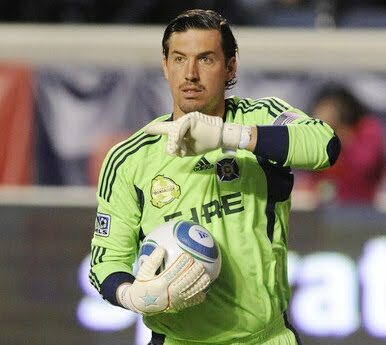 "This is a big week for us," Fire goalkeeper Jon Conway said following Saturday's 2-1 loss to the Philadelphia Union. "We have a goal of advancing to the Open Cup and doing well in that. We need to get everything right on the field and build some momentum heading into our next match Saturday. Every match is critical toward wronging the mistakes we have made." In other Fire news, midfielder Marco Pappa will be called in to Guatemala's club for the 2011 CONCACAF Gold Cup. Pappa will miss minimally two league games for Chicago. CHICAGO -- This summer, take your soccer skills to the next level while learning alongside one of the most renowned U.S. Soccer forwards to play the sport -- Arlington Heights native and 17-year professional Brian McBride. McBride's Attacking Soccer Academy announces its 2011 Summer Camps schedule, with locations in Arlington Heights (June 20-24), Glen Ellyn (July 18-22) and Lincolnshire (July 25-29). Camps are for boys and girls, ranging from 8 years old to high school-aged participants. "I'm looking forward to this summer's academy camps," McBride's Attacking Soccer Academy President Brian McBride said. "These camps will incorporate the drill-based classes that I have, with fun shooting games and competitions throughout the week. My goal is to help make each and everyone in the camp a better attacking player, no matter what age your child is." The two-hour, five-day sessions provide a foundation for participants to excel in the attacking side of soccer. This fun and exciting environment helps your child improve at scoring goals, and helps his or her teammates improve offensively. "At the younger ages, we will focus on the foundation of a good attacking player, while building on those foundations for the older players," McBride said. "I will ask all players to challenge themselves, while making sure we provide a challenging and fun atmosphere. I hope to see you at one of the camps this summer." Camp participants receive a McBride's Attacking Soccer Academy T-shirt. At the conclusion of Friday's session, the academy will have a pizza party, and parents are invited to join their kids for food and a chance to win raffle prizes. To sign up for the academy's summer camps and for more information, visit McBridesAcademy.com, email brian@mcbridesacademy.com or call 847-577-9904. McBride's Attacking Soccer Academy emphasizes five important tools for players: thought processing, dynamic movement, technique, heading both inside and outside the box, and pure shooting. McBride's training hones in on players understanding their roles and enhancing their skills to become complete soccer players. • Arlington Heights Summer Camps (June 20-24): Olympic Park, 660 N. Ridge Ave., in Arlington Heights, Ill. -- 9 to 11 a.m. for 10- and 11-year-olds; 11:30 a.m. to 1:30 p.m. for 12- to 14-year-olds and high school-aged participants. Cost: $200. • Glen Ellyn Summer Camps (July 18-22): Ackerman Park, 800 St. Charles Road in Glen Ellyn, Ill. -- 9 to 11 a.m. for 8- and 9-year-olds and 10- and 11-year-olds; 11:30 a.m. to 1:30 p.m. for 12- to 14-year-olds and high school-aged participants. Cost: $250. • Lincolnshire Summer Camps (July 25-29): North Park, 1025 Riverwoods Road in Lincolnshire, Ill. -- 9 to 11 a.m. for 10- and 11-year-olds; 11:30 a.m. to 1:30 p.m. for 12- to 14-year-olds and high school-aged participants. Cost: $250. 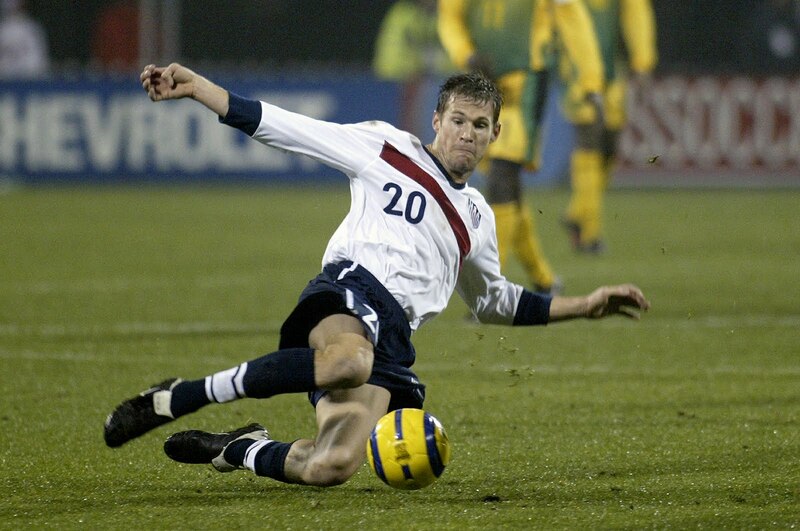 McBride's Attacking Soccer Academy is headed by 17-year professional soccer player and Arlington Heights native Brian McBride. McBride had an illustrious career that spanned across Premier League clubs Fulham and Everton, Major League Soccer's Chicago Fire and Columbus Crew, and included three World Cups for the U.S. National Team. For more information about McBride's Attacking Soccer Academy, visit McBridesAcademy.com, email brian@mcbridesacademy.com or call 847-577-9904. Philadelphia Union forward Carlos Ruiz simply had one of those goals where you just tip your cap and try to move on. Ruiz's long-distance strike in the 75th minute was the difference in a 2-1 win over the Chicago Fire on Saturday at PPL Park in Chester, Pa.
Ruiz's game-winner came shortly after his free-kick chip was cleared out of the box by Fire second-half sub Logan Pause. From about 30 yards out, Ruiz took a left-footed shot that went over Fire goalkeeper Jon Conway, skimmed off the bottom of the crossbar and went into the goal for a 2-1 lead. The winning tally stretched Chicago's winless streak to eight games, after the Fire (1-4-5) had previously earned a draw in four consecutive matches heading into Saturday. "He just hit it as hard as he could," Conway said of Ruiz's strike. "I'm not sure if he was even trying to get it on frame. I felt I was in a good spot, but it just dropped into the goal." BRIDGEVIEW, Ill. -- Nearly two months have passed since the Chicago Fire's last victory, and it is almost a moot point that Chicago has not lost, either, in its past four matches. Chicago travels to PPL Park in Chester, Pa., to take on the Philadelphia Union on Saturday, and the Fire are hoping to get more than a point against the second-place team in the Eastern Conference. "We are close to winning," Fire head coach Carlos de los Cobos said. "I believe in this. We are close to winning." Close is an accurate description for a team that is tied for the league lead with five draws. But Chicago also is one of only three teams with just one victory on the season (Sporting Kansas City and the Vancouver Whitecaps being the other two). 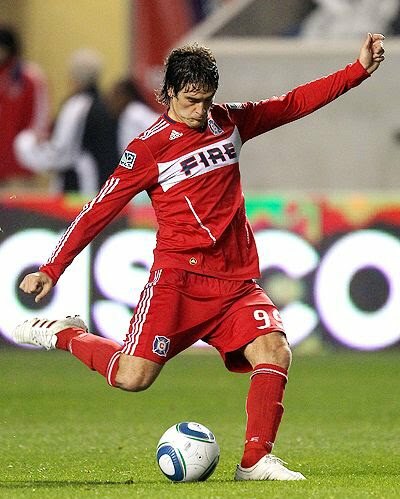 BRIDGEVIEW, Ill. -- In the mind of Chicago Fire head coach Carlos de los Cobos, even the team's captain will have to earn his starting spot back. Fire defensive midfielder Logan Pause has missed the last several weeks because of a hamstring injury, paving the way for Daniel Paladini and Corben Bone to take starting roles in the central midfield for the past three matches. Pause trained heavily on Thursday and appears to be nearing a return, perhaps this Saturday when the Fire (1-3-5) travel to Philadelphia (4-3-2). But De los Cobos said that he is going to continue with the midfield he has penciled in over the past several weeks, even if Pause is ready to go. "I want to keep the guys who are playing because they are making a good job," said De los Cobos, whose team has posted a 0-0-3 mark during Pause's absence. "Logan is always important for me. For that reason, he is our captain. He was three weeks out and the team is playing good. I always need Logan. I think he's a good leader with the group. I'm sure that he's a smart person and a smart guy, and he understands the situation. He will work for returning to play." Chicago Fire midfielder and 2010 first-round draft pick Corben Bone spent all of last season waiting for a moment to prove his worth. Bone saw his fellow draft teammates getting significant playing time, as goalkeeper Sean Johnson and defenders Steven Kinney and Kwame Watson-Siriboe each logged 10 or more games last season. Bone, however, logged only 114 minutes in five league games. But last year's 13th overall selection out of Wake Forest is finally getting his chance this year, and he is coming off his most impressive performance during the Fire's recent 2-2 draw against Toronto FC. "I haven't had too much success in the past year, but I'm starting to get some games now, and it's been the best game for me so far," said Bone, who assisted Orr Barouch's game-tying goal on Saturday. "I was pleased with my performance and I was pretty good in spots, got to go 1-on-1 a couple times when I got the ball in the box and was able to make some good passes. Overall, I found the ball a lot." Former Chicago Red Stars midfielder Lindsay Tarpley tore the anterior cruciate ligament in her right knee with 15 minutes remaining in the U.S. Women's National Team's 2-0 victory over Japan on Saturday in Columbus, Ohio. U.S. Soccer announced Sunday that the injury will sideline Tarpley for six to eight months, preventing her from playing in the 2011 FIFA Women's World Cup. 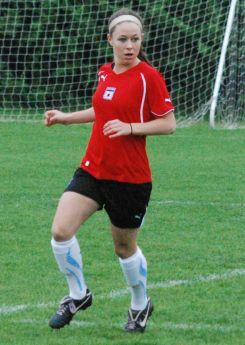 Tarpley tore the ACL in the same knee at the end of the 2009 WPS season when she was with the Red Stars. The Chicago Fire have been kings of the draw of late, posting their fourth straight stalemate with a 2-2 decision against Toronto FC on Saturday at BMO Field. While the Fire (1-3-5) are in the midst of a seven-game winless streak, Chicago had to feel positive with coming away with a road point. The Fire overcame a 2-0 deficit against the Reds (2-4-5). Orr Barouch's first goal in the 76th minute gave Chicago the eventual draw, and Marco Pappa's free kick strike in the 64th minute swung the momentum in the Fire's favor. Despite the big deficit, the Fire had a great chance to take the lead in the 83rd minute. Daniel Paladini tried to chip the ball over Toronto goalkeeper Stefan Frei, but Frei came up with a huge save with his left glove to preserve the draw. Frei and Fire goalkeeper Jon Conway each had six saves on the night. BRIDGEVIEW, Ill. -- The Chicago Fire and Toronto FC have some similarities in that both sides underwent some significant turnaround heading into the year, and both are struggling near the bottom of the Eastern Conference. The Fire head to BMO Field this Saturday to take on the Reds, and both sides could use a lift. Chicago (1-3-4) is in the midst of a 0-3-3 stretch and is winless since its home opener on March 26 against Sporting Kansas City. Toronto (2-4-4) did garner its second win on May 7 against Houston, but the squad is coming off a 1-0 loss to FC Dallas on Wednesday. The Reds have the home-field advantage in their corner this weekend. Toronto is a respectable 2-1-3 at BMO this season. "We're definitely anticipating for them to come at us in the first couple of minutes, especially with the crowd -- it's always a hostile crowd," Fire defender and midfielder Gonzalo Segares said. BRIDGEVIEW, Ill. -- The Chicago Fire offense possessed the ball for almost 70 percent of their scoreless draw against the expansion Vancouver Whitecaps last Saturday. They garnered a miniscule point in the standings and no goals to show for their efforts. The team's finishing touch has been absent for more than a month now. Chicago (1-3-4) showed promise right out of the gate, particularly with a three-goal effort en route to a 3-2 win over Sporting Kansas City on March 26, followed by a 2-1 win over the Colorado Rapids on March 30 in a Lamar Hunt U.S. Open Cup play-in match. The Fire have not posted a multi-goal effort since then, and the 4-2 loss to the Portland Timbers on April 14 included both defenses swapping own-goals. So where has the finishing gone? How can a team that has the ball for two-thirds of a game not manage to tally a single goal? "The confidence is always important, and maybe it's the technique in the moment, the way that you shoot the ball, the way that you have reception of the ball after you shoot," Fire head coach Carlos de los Cobos said. "Maybe it's the pressure of this moment because the player -- I'm talking generally -- has a good option and he misses, which is part of this game." BRIDGEVIEW, Ill. -- Chicago Fire assistant coach Leo Percovich can chew out someone in one moment and be the nicest guy in the next. On one end of the spectrum, Percovich brings necessary energy to training, as well as a strong voice. That voice did land him a fine during the preseason's Carolina Challenge Cup, when he had a few choice things to say to the officials. But on the other end of the spectrum, Percovich has gone out of his way to try to establish a sense of "harmony" within the club. During the preseason, Percovich purposely mixed and matched roommates from various countries so the Fire's heavily revamped lineup could get acclimated to one another before the season began. "We have 11 or 12 nationalities on the team, different cultures, religions and habits," Percovich said. "You have to have the same character and same spirit on the team. That's very important for everybody to stay in the same habit. At the end of the preseason, we had a group where everybody knows everybody." The Chicago Fire announced Wednesday that they will face the San Jose Earthquakes on May 24 in a Lamar Hunt U.S. Open Cup play-in match at Buck Shaw Stadium in Santa Clara, Calif. The game kicks off at 9:30 p.m. CT. 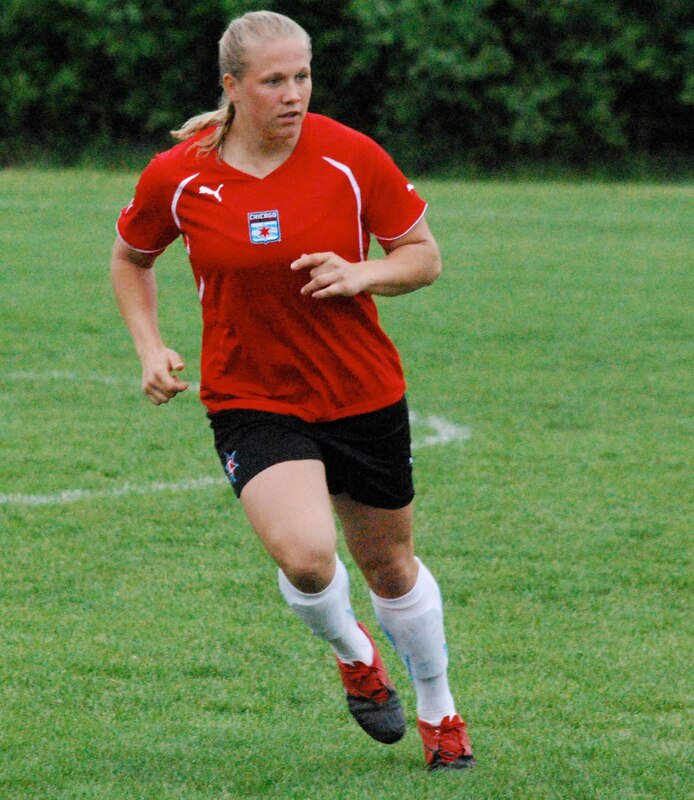 The Chicago Red Stars of the Women's Premier Soccer League announce four additions to its 2011 roster. Joining the Red Stars roster are University of Illinois forward and Naperville, Ill., native Vanessa DiBernardo; University of Illinois forward and Homer Glen, Ill., native Shayla Mutz; Indiana University forward and Barrington, Ill., native Carly Samp; and University of Louisville goalkeeper and South Elgin, Ill., native Taylor Vancil. 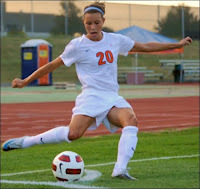 DiBernardo made a big splash during her 2010 freshman campaign with the Illini. The Waubonsie Valley High School graduate led the Big Ten Conference in goals (11) and points (27), started in all 19 matches and garnered Big Ten Freshman of the Year honors. 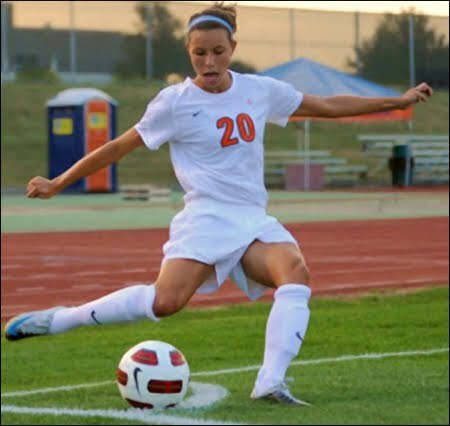 Mutz, a Lockport Township High School graduate, started in all 19 matches for Illinois, ranked third on the team with four goals and tied for third with 10 points. Samp completed her junior season with Indiana, leading the club in goals (8) and points (19) in 2010. Vancil wrapped up her sophomore season with Louisville. The St. Charles North High School graduate played in all 19 matches for the Cardinals in 2010, posting a 10-9 record, five shutouts, 125 saves and a .796 save percentage. 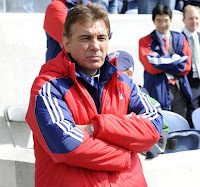 BRIDGEVIEW, Ill. -- Chicago Fire head coach Carlos de los Cobos stands by his approach -- possession game, attractive soccer and offensive-minded soccer. The Fire handled the possession aspect on Saturday against the expansion Vancouver Whitecaps. The clear problem was that Chicago had no final touch and played to a scoreless draw in front of 11,680 at Toyota Park. The Fire (1-4-4) are winless in six straight games. "I want to play football," De los Cobos said. "For me, it's very easy to put the ball forward with long balls, but I don't like it. I'm going to die with my idea, with my philosophy to play. It's possible to happen whenever. I believe in myself. I believe in my players." The theme on Saturday was missed chances, but they were amplified by the fact that Chicago had plenty of space to work with and high-percentage scoring chances throughout the night. The Fire's productivity, however, resulted in only a 4-2 shots on goal advantage over the Whitecaps. BRIDGEVIEW, Ill. -- This is not quite a do-or-die part of the MLS season, but the Chicago Fire have quickly dug themselves into a hole over a five-game winless streak. May represents a critical month for the Fire, who are second-to-last in the Eastern Conference. With three of Chicago's four May matches against teams with losing records, it is the club's best situation to make up some ground. One of those teams is expansion Vancouver Whitecaps FC, which the Fire hosts for the first time Saturday at Toyota Park. Vancouver's defense has allowed the second-most goals (14) among MLS clubs, but Chicago's offense has been in a little funk with only three goals in its past three games. "We need to win -- it's very important for us to win Saturday," Fire head coach Carlos de los Cobos said. "The guys are trying to finish, but that's part of the game. Sometimes it doesn't happen." The Fire (1-3-3) have yet to earn a league victory since their 3-2 home opener over Sporting Kansas City on March 26. Soccer players have their unique paths to get to the professional ranks, but Vancouver Whitecaps FC defender Jay DeMerit's is as rare as they come. The former University of Illinois-Chicago standout and one-time Chicago Fire Reserves player has seen it all, and paved his way when the elements did not look so favorable. DeMerit was not a part of U.S. Soccer's youth system. He joined UIC on a partial scholarship, which took some doing to even get that. He played for the Fire's development team, but was not picked up by a Major League Soccer club. And the most defying stunt was heading to Europe with less than $2,000 in his pocket and hoping to launch a playing career. Anyone who has remotely followed the Green Bay, Wis., native's journey knows that DeMerit eventually reached greener pastures, spending seven seasons with England's Watford FC, and highlighted by his playoff goal against Leeds to thrust Watford into the Premier League in 2006. "My path is very rare. I never even tried out for a national team," DeMerit said of his youth playing days. "I was one of the rare ones that just always played sports. At UIC, they have a good soccer community and good soccer structure. I never tried to branch out to ODP (Olympic Development Program). I was just working hard and concentrating on other things in life. I had very limited soccer experience as a 23-year-old grad, getting offers to A-League teams, the Milwaukee Rampage, without any experience." The Chicago Fire brought in 20-year-old Colombian Cristian Nazarit on Wednesday -- a 6-foot-1 target forward who recently was playing for Colombian Primera A side Independiente Santa Fe. In the Fire's grand plan, the club clearly hopes that Nazarit or some other striker will provide scoring power to complement Diego Chaves, who leads Chicago with four goals. Chaves has been a workhorse for the Fire, and for much of the season he has been Chicago's only go-to guy on the scoring front. Chaves also has noticeably lost some steam in the closing minutes of Chicago's recent games, so adding an offensive weapon -- provided the Nazarit plan comes to fruition -- is a welcome addition for the Fire. But Nazarit's signing also does not address the Fire's most immediate needs, the biggest of which is an established central midfielder. Even through seven games, the Fire have yet to finalize the look of their middle formation. The Fire's 10 goals in seven games is pretty much on par with the rest of the league's offenses. Heading into this week, before Wednesday's slate of games, there were four other MLS clubs with that exact goals-to-games ratio, including the Eastern Conference-leading New York Red Bulls. The major difference between New York and Chicago is that the Red Bulls (4-1-2) have allowed only two goals this season, while the Fire (1-3-3) have given up a whopping 13. 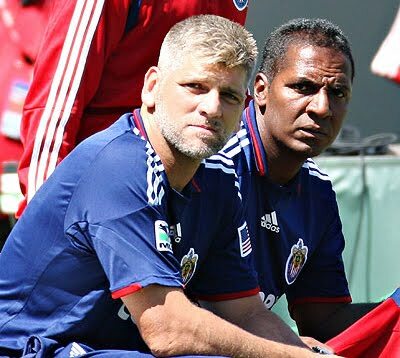 BRIDGEVIEW, Ill. -- When Chicago Fire captain and defensive midfielder Logan Pause injured his hamstring on Wednesday of last week, it caused head coach Carlos de los Cobos to rethink his strategy heading into their game against the defending MLS champion Colorado Rapids. Initially the Fire were training to play a standard 4-4-2, with Pause naturally in the mix. But when Pause was out of the picture, De los Cobos adjusted with a 4-1-4-1. Chicago posted a 1-1 draw on the road, and the formation switch could stay in place, especially if Pause and midfielder Mike Videira (concussion) are unable to go this Saturday when Chicago hosts the expansion Vancouver Whitecaps at Toyota Park. Last week's match in Commerce City, Colo., opened the door for Fire midfielders Daniel Paladini and Corben Bone, who made their first starts and appearances this season. 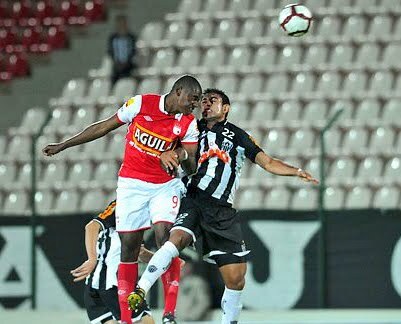 Uruguayan forward Gaston Puerari dropped back in the midfield, as well, leaving fellow countryman Diego Chaves as the team's lone attacker. "We came out and played our system, and went attacking with four, five guys," Paladini said. "We're losing maybe a forward, but gaining an extra guy in the middle. We didn't go to Colorado to back up and play defense."